We deliver a premium service and receive excellent reviews every time. Setting the standard for removals in Exeter and Devon by providing a professional, high quality removals service, while offering great value for money. Trusted removal company in Exeter, Devon. We'll come and visit your home to quote for free! Customers in Exeter love our removal service. Van Man Removals Exeter work locally and nationally helping people move home to and from Devon and the Westcountry. 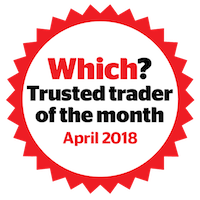 We are very proud to be a member of Devon and Somerset council’s Buy with Confidence scheme which means that our removals company is fully approved by their trading standards team + we are now a Which? Trusted Trader! Van Man Removals Exeter has a team of friendly, trained and uniformed removal staff who drive our smart range of modern removals vans, but this high quality service won’t cost as much as you might expect. Please browse our site for more information on how Van Man Removals Exeter can assist you and for a free quote please click here. We are always happy to come and visit your property in and around Exeter to provide a free no obligation removal quote. So how can Van Man Removals Exeter help you? Van Man Removals Exeter's mission is to offer our customers the service they would expect from a national removal company but with the personal touch and the much lower price. We specialise in house removals, from a small bedsit or flat to a large house move. We also have our own in house secure storage facility in case you’re not able to get in to your new place straight away. Van Man Removals Exeter also carries out office moves. Check out our reviews page to hear from some of our happy business customers. Van Man Removals Exeter can pretty much do any job, so do get in touch to see how we can assist with your removal and arrange a free, no obligation visit from one of our team. Van Man Exeter Removals offers our services across Exeter, Devon Removals Tiverton and nationally. You can read more about all the services provided by Van Man Removals Exeter on the links at the top of this page. House removals Exeter and removals Devon - We can cater for all sizes of household removals within Exeter, Devon and beyond. Our polite, hard working staff will make your removal run smoothly. Please click on the title for more information on how Van Man Removals Exeter can help with your removal. Small removals Exeter and removals Devon - Van Man Removals Exeter is always happy to help with a move no matter how big or small. If you are moving from a flat, studio or house share please get in touch and we will be happy to help. Office removals Exeter and Devon - Van Man Removals Exeter is pleased to offer an office relocation and removals service. Working 6 days a week means we can get your office move done with as little down time for your business as possible. We offer our office removal service across Exeter and Devon and can move you anywhere in the UK. Storage Exeter - Van Man storage is now open and we can collect and deliver goods to our secure storage facility . Removals packing service Exeter - Van Man Removals Exeter is pleased to offer our customers a packing service. We can supply all the materials you will need at great prices and come in prior to your move to get everything safely packed up. Just let us know when getting a quote and we will make the arrangements. We can also offer a professional export wrapping service. Exeter to London removals - One of our most common removals requests is from people moving to and from Exeter and London. With our modern and efficient vehicles we can always offer a competitive removals quote.